Indulge your patrons with the rich, creamy flavor of caramel blended into their coffees and specialty drinks with this Torani 16.5 oz. caramel flavoring sauce! It is packaged in a user-friendly 16.5 oz. plastic squeeze bottle, making the sauce easy to dispense. Featuring a thicker consistency than liquid flavoring syrup, this flavoring sauce is great for swirling atop whipped cream or blending into sweet frappes. It adds just the right amount of sweet, buttery caramel flavor to any cup of freshly-brewed coffee. You can even use it to top ice cream, cheesecakes, and other homemade desserts. This Torani sauce will be the perfect, finishing touch to any beverage or dish, and is sure to keep your guests coming back for more! We use this Carmel with several of our frappe mixes!! It goes well frappe bases!! You can also add this to any ice cream or iced coffee! This caramel syrup is wonderful in hot beverages like coffee and cappuccinos. We also use it as an ice cream topping on sundaes and banana splits. Don't skip the presentation, even at home. We have a blast decorating drinks and plates with these sauces. The kids really engage in making their foods when they know they have made art. And being caramel doesn't hurt this sauce! Great item for at home use and very good quality. Great gift item, we used for door prize and it was very popular. We will purchase again. Torani makes some of the most delicious flavoring sauces. We own coffee shops and ice cream shops and now this is in both of them. It is really popular. All of our customers really like it. I think this tastes better than every single substitution caramel sauce I’ve tried. It is great for using on top over beverages because it’s thick and not too runny. However, it is made from high-fructose corn syrup and Webstaurant sells other brands that aren’t made from that stuff…I should have done my homework and picked one of those. Other than that, no complaints with this version. This caramel flavoring sauce is great to use in and on top of pretty much any drink. The small bottle makes it the perfect size to drizzle on top of drinks. A very nice easy to handle bottle of caramel flavoring sauce. The caramel is very rich and thick making for a great dessert topping. One of the best caramel sauces on the market. This is a great tasting flavoring sauce that i enjoy in coffee amd also on ice cream. It is very versatile and can be used for all types of deserts. This is a great product for decorating our cupcakes and flavoring our confections, perfect size bottle and it drizzles perfectly and easily, without the mess! Best caramel flavor for coffee drinks and great consistency! We have tried other brands of caramel sauce but nothing beats the flavor, packaging and size of torani. It stores great on the shelf since no refrigeration is needed. I'm so excited to use this caramel syrup with the caramel cream K cups I bought here! It's so great having your own caramel syrup at home no need to spend six dollars on a fancy coffee drink. Torani caramel sauce is my all time favorite caramel to use in all of my hot and cold coffee drinks. I also use it to drizzle over my salted caramel cupcakes. 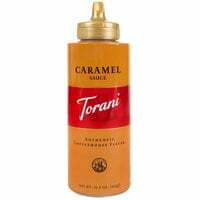 Torani caramel flavoring sauce is not just for topping things. We also use it as a dipping sauce. We like to dip homemade pretzel bites in it. Yum! We used this sauce at our coffee shop as a drizzle only, or using it in our baking desserts. Or has a good flavor and def gets the job done. This caramel sauce is absolutely amazing. I love the convenient container and the amazing price. The taste is great quality and the lid stays clean and clear of clumps. Smaller bottle of caramel flavoring that we use to drizzle on top of whipped cream on our caramel beverages to give it an extra bit of flavor. Taste great. This sauce is so good you won't believe it. Tastes rich and sweet like caramel and sooo sooo good on top of pretty much anything! Great selection of Torani sauces offered on Web. This is a great size Caramel Flavoring. The 16.5 oz in the squeeze bottle is perfect for smaller volume locations. This caramel sauce is delish. I use it in coffee and on top of my ice cream. This item doesn't need to be refrigerated once opened which is awesome. I absolutely love this flavoring sauce on my coffee mix with a little bit of hazelnut syrup and the result is simply AMAZING...i will be ordering more for back up. This is good for flavoring almost anything with sweetened caramel or as a drizzle or fuller topping. The taste is good. It's a quality product. I use caramel sauce to drizzle on my salted caramel mocha cupcakes, and this caramel sauce works well for a light drizzle. It tastes great and looks great too! We found this sauce to be just the right balance between sweetness and butteryness. It has depth of flavor that is not taste just like pure sugar, but is not overpoweringly buttery like some caramels can be. We were also happy with the consistency: thick but not super thick like fudge. It is easily pourable but not too runny. Comes out cleanly from the bottle and is easy to control straight out of the bottle (nozzle is good). This sauce is so delicious it is the best to make a caramel macchiato especially making it at home and no need to go out! The perfect addition to the ice cream ,smoothie that we offer. The customers cant get enough of it and continues to ask for it by name. I am close to running out so its time to stock up. Great tasting caramel. It has a great designed squeeze tube (flip top cap) and doesn't need refrigeration once opened. You don't need much to taste the flavor, a little goes a long way. It is great for beverages and ice cream. Torani's caramel sauce is awesome. I first tried it at an ice cream place, and then saw it on webstaurant. I'm glad I bought it! I especially like using it in my home brew coffee! I use a lot of this caramel sauces on frappes and ice cream. Its a good quality caramel, and best of all you don't have to refrigerate it. Torani's caramel sauce is great quality. It has a great taste and is perfect for both drizzling over drinks or mixing into lattes. Great buy! What an awesome deal on drizzle! We use this on espresso drinks, frappes and some smoothies. Also great for making caramel blended frappes. Great product! This Torani caramel flavoring sauce is excellent. It delivers a great taste and it works very well for adding that special flavor/ We recommend this for sure. Excellent flavoring sauce, that comes in different varieties. We mainly use them for desserts and drizzle for pies and cakes. It offers great, satisfying flavors. We use this as a drizzle on whip cream for hot chocolate. It is thick, not runny, and stays on the cream without falling off into the beverage. Gives a nice presentation to customers. I bought this sauce and also bought one of them ice cream syrups. Not the same at all. no caramel taste from ice cream syrup. Buy the Torani sauce instead. This caramel sauce is THE god of all caramel sauces, I used to buy the caramel sauce that that famous chain shop sold and then they stopped selling it, I thought I was going to have withdrawals!!!!!! I couldn't find anything that even came close to my old favorite, until..........I found the Torani Caramel sauce, this is now my overall favorite bar none, once you have tried this sauce you will be hooked, it should have a warning on the bottle "Highly Addictive" you can't beat the price or the service that you get on here either. Win, Win!!!!!!! This is a nice and thick caramel sauce with rich buttery flavor. I would definitely recommend and is a great addition to anything and everything. We love using this caramel sauce as drizzle on our milkshakes and ice-cream. It's thick enough to look good on the shakes and ice-cream but not thick enough to became clumpy. Our customers really love this. We often times purchase the bigger bottles for storage and the smaller ones such as this for our toppings bar. The bottles are beautifully packaged and Torani is one of the leading syrup manufacturers in the world. Torani Caramel Sauce is a great tasting sauce that we use in our specialty coffee drinks and on a few of our desserts. The complex flavor helps our items stand apart from the rest. This is a coffee shop MUST HAVE. Customers are requesting this be drizzled on almost every drink we offer. I can never have enough of this in stock! The caramel has great flavor and consistency. It works perfect for topping caramel lattes (on whipped cream). People love the flavor and sweetness it adds. I love the caramel sauce both for my coffee shop as well as for my own personal uses. You can cook, garnish and flavor so many things with this. I ordered this small bottle to complement my milk shakes as a garnish. I absolutely love the taste of this caramel sauce. I use it as garnish on drinks and as a flavoring in my macchiatos and my cappuccinos. I had originally NEVER liked caramel,I even used to go as far as say I was allergic so I never was given anything with caramel in it until one day someone begged me just to try a drink drizzled with Torani Caramel on it... OMG!!!! YES I love this stuff ,i had to find a way to get my own so i bought 4 bottles on here just a few wks ago n everyone used it on everything!!! I would look for new excuses to eat it :) it'll surprise you how rich buttery smooth yummy n delicious it is and this site is the best price too!!! Mmm thank you for selling Torani Caramel!!!! Buying more asap! This Torani caramel sauce is okay. But it's not as rich of a butter caramel as I had hoped it would be. It's good on ice cream, and okay in espresso drinks. I absolutely love this stuff!!!! It's delicious in coffee or on ice cream. I will be buying more of this sauce. Great for homemade iced caramel macchiatos. I had not tried this brand before and was amazed at the flavor when I did. Recently made a pear tart...topped with vanilla ice cream and a drizzle of this caramel flavoring...FABULOUS!!! Will be back for additional flavors.